WATCH: We denounce the arrests and detentions of participants in excessively policed demonstrations. Free Arrests! Protest against police state & capitalist summit! Take simultaneous actions on Saturday 12th July. 3 of our friends unjustly arrested at the demonstration against G8 summit on 5th July. One of the arrested is actually an indymedia activist who is organizing sound actions and a member of G8 Media Network which is organized by non-profit and non-govermental various grassroots media. The exerciser of overwhelming violence was the police. For instance, they stopped the track forcely, broke the window with policeman’s club etc, and dragged out the driver while hanging him. 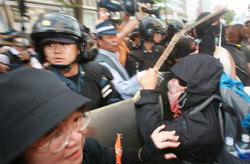 This situation was exposed as Japanese police brutality again, reported by independent media. While most of Japanese media coverage focusing around the summit, one of homeless activists in Osaka had quietly, unfairly arrested on 4th. Alleged that his mobile phone ownership and user was different in name. Even though his group from Osaka had been planned to come and join the poverty & labour unit of couter G8 Action Network but they cannot in order to resucue him just after the liberation of another one who was also arrested by tiny bureaucratic mistake last month. All of them are unreasonably trivial things. Suppression of dissent, obviously. We denounce suppression to the sound demonstration and homeless activists by the police, and demand immediate releasing of all. On 12th July, simultaneous protest actions will be taken 3pm in Sapporo, Tokyo, Osaka, etc. against police capitalism. Call for international solidarity! Take actions simultaneously! Protest against unjust arrests, police violence and capitalist summit. in solidarity with indymedia japan.